Q: Can you please tell our readers a little bit about yourself and some of your personal story? I grew up the daughter of American missionaries in rural areas of Colombia that are now guerrilla hot spots. I graduated in 1981 from Prairie Bible College in Three Hills, Alberta. In 1985, my husband Marty, also an MK (missionary kid) and I moved to Bolivia to work with Gospel Missionary Union (now AVANT), an interdenominational Christian mission organization. While my husband served as field director, I worked with women and children at risk. I also began my journalism and fiction-writing career there, watching firsthand the political and drug-trafficking shenanigans of one of the world’s top-five most corrupt nations. My husband and I moved to Miami in June, 2000, when Marty assumed the position of Vice-President with Latin America Mission, a nondenominational mission organization working throughout Latin America. In January, 2006, we moved again to Lancaster, PA, when Marty accepted the position of President of BCM International, formerly the Bible Club Movement, another nondenominational mission organization. I continue to write as well as teaching writers conferences and mentoring Christian writers in a number of countries around the world. To date, I have lived in six countries and traveled in more than twenty. I have four children: three grown sons and a teenage daughter still at home. Q: I believe you are to Colombia as Tom Clancy is to the military. The stories in your books are fiction but you know while reading them there is much truth. Can you tell me how you researched for your book Betrayed? Without giving all my sources, I will say that I saturate myself in the country of which I am writing, reading dozens of books, Internet, video, interviews, etc, as well as when possible traveling to each site, until I can literally draw you a map of the spot of which I’m writing and mentally walk through its streets. I will also consult with experts on each element of the political/suspense plot. Details like the exact composition of a clandestine runway built by hand labor in the jungle (The DMZ) or an aerial gun battle between Huey and Black Hawk helicopters (Betrayed) ring true because they come from ‘boots on the ground’. Q: I have read that you have been questioned several times by the US Government about your knowledge of information it considered “classified.” How did these individuals feel about your books being published? Yes, I have been questioned by government personnel as to where I got research and information theoretically ‘classified’ in several of my books, and have had feedback from U. S. government personnel ranging from DEA, State Department, SouthCom, military intelligence, law enforcement and others. I keep meticulous notes, so have always been able to satisfy any questions. Bottom line, what is considered ‘classified’ in the U.S. is often common knowledge on the ground in another country, and those who live and serve there ‘out there’ know reality only too often better than that summarized in the info briefs of our intelligence community. Once satisfied, I will say I’ve found such ‘front-line’ professionals care most of all that any book depicting their vocation or field of service do so fairly and accurately. Since I’ve been careful to do that, on the whole they’ve been very pleased with the books and extremely helpful in opening further doors of research to me. Q: You could easily write in many different mediums. How did you come to choose fiction? I began as a journalist, but branched out to fiction in part because I was sitting in the middle of stories too big—and sometimes too sensitive—to tell in any non-fiction format open to me. What I love about writing fiction is the tapestry it offers to weave together countless scattered threads—historical, political, social, spiritual—and the very real people involved, to create a single impact, a single focused spiritual theme. While the books I write are fiction, the peoples and places and issues they bring to life are only all too true. Q: As a reader, you made me view a different side of Sarah in the bible. You call women Sarah’s daughters. Can you please explain what you mean? The quote comes from 1 Peter 3:6, when it says we are Sarah’s daughters if ‘you do what is right and do not give way to fear.’ Interestingly, the passage is most often taught in relationship to women’s outward apparel vs. inward beauty and submission. But the context gives us a biography of Sarah, Abraham’s wife, described as a beautiful woman inwardly as well as outwardly, who finds herself in crisis through the wrong doings of others. In particular, her husband, who twice lands Sarah in a harem to save his own skin. Nor is it Sarah’s loving husband who ever comes to her aid, but her heavenly Father. What are we called to do when faced with difficult and frightening crossroads in our lives? Not to manipulate, try to figure out the future, or weasel our way out by any means possible. But exactly what Sarah was called to do in the middle of a harem with no one she could count on to come to her rescue: ‘Do what is right, and do not give way to fear’. If we follow that simple, yet profound, example, then the Almighty God who intervened in Sarah’s life and holds us in the palm of His loving hand will take care of our present and future, whatever He chooses that to be. Unfortunately, when we forget that principle—as Sarah did just once between those two harem experiences when she gave her handmaiden Hagar to Abraham to manipulate a fulfillment to God’s promise—we can sow seeds that disrupt God’s plan, not only for our lives but the lives of others, even change the course of human history. Q: Many of us do not have knowledge of what is occurring in Latin American. I like when Cesar said, “Either they do not believe it could be so bad, the people must be exaggerating, or they throw money at us as though rebuilding houses or schools will wipe away all that has happened.” Why should we as Americans, Canadians or wherever we are from, learn more about Latin America? The world is getting smaller, and what is happening outside our suburban neighborhoods is becoming every day more relevant—and more a threat. In North America especially, let us not forget that Latin American countries where lawlessness, corruption and instability continue to spread, where anyone with enough money can live outside the law with total impunity, are only a short airplane flight away. That includes documented Islamic fundamentalist groups who are as likely to slip across our unprotected borders posing as Hispanic as to fly into our airports conveniently identifying themselves with Middle Eastern passports. At the same time, what has happened and is happening in Latin America, and especially why, is a microcosm of similar patterns of history and politics around the world and of our involvement as Western governments in those patterns. 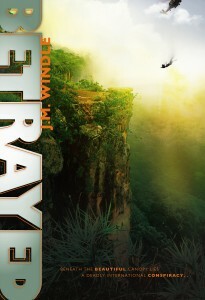 Understanding a single and fictionalized situation in Guatemala, portrayed in the pages of Betrayed, gives understanding to what is happening around our world right now on many fronts and the only too real consequences of decisions made by powerful individuals for motives of fear or greed rather than right and wrong. Q: Throughout your book Betrayed, you repeat “do what is right and do not give way to fear.” As Christians can you explain how that motto can help us reach out and help others? Whatever we may wish, God never promised a safe and quiet life to His children. All over this planet, Christians are standing on the front lines of danger and persecution. And that is as it should be because the God we serve, who rides on the wings of the wind and makes storm clouds His footstool, has called His children to be the ones willing to stand out there in the storms of chaos and uncertainty shaking our planet, nailing down the loose roof shingles and pulling people from the floodwaters. Too often as Christians living in the comfortable West, we get the idea that our first responsibility is to secure safety and peace for ourselves and our loved ones. But if that is our ultimate aim, we will find ourselves too easily making compromises based on fear or personal self-interest to secure that aim. We are living right now in our political landscape with the consequences of such compromises, of which Betrayed tells only one small piece. What is our call, how can we know what to do, when our world falls apart? The answer is as simple as it is profound. At every step and with each crossroads that opens up in front of us, simply ‘do what is right and do not give way to fear’. If that seems a troubling challenge, it shouldn’t be because our safety, and the safety of our families and our country, are not, and never will be, in the absence of the storm, but in the presence of a heavenly Father who loves His children passionately and holds them safely and tenderly in the palm of His Almighty hand. Q: Betrayed is an excellent book and story. But I have the feeling you don’t want me to just read it and walk away. What would you like your readers to do once they have finished reading? Choose to be more involved in their world beyond the four walls of their home and the streets of their own neighborhood, even if it is only by becoming more informed and through prayer. On a personal level for every reader, my prayer is that they will make the choice when confronted with crisis (as comes inevitably to all of us at some point or another) to ‘do what is right and do not give way to fear’. Q: You are obviously busy as a wife, mother, missionary and author. How do you find the time for the research and writing of a book? Can you tell me what other projects you are involved in? The last year or so has been busy with setting up a media department and magazine for BCM International, the ministry of which my husband is president. But my greatest delight in ministry continues to be teaching writers conferences and mentoring indigenous Christian writers in more than a dozen different countries from Mexico, Guatemala, Ecuador, Brazil, Spain, to Croatia and the Philippines, as well as in the U. S. in both English and Spanish. I also speak at women’s events and retreats and missions training seminars as time permits.